Drink Umbrella Wreath · A Recycled Wreath · Version by Miranda H.
Based on Drink Umbrella Wreath by Christine A. This was such an easy, cute project for Summer. 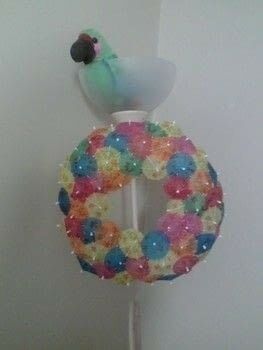 It is fragile though so I didn't make it a center piece in decor, instead it's off to the side but still makes a pop in my Aunt's Parrot Head themed beach condo! I got my Umbrellas from Hobby Lobby & ended up using about 55-60 to cover the whole thing!